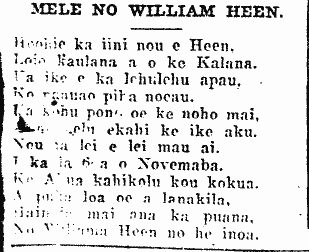 Another political mele for William Haehae Heen, 1923. A MELE FOR WILLIAM HEEN. Loio kaulana a o ke Kalana. [Unclear passage] ekahi ke ike aku. I ka la 6 [?] a o Novemaba. A puka loa oe a lanakila. No Wiliama Heen no he inoa. On the 6th [?] of November. And you will win the election. Ka Nupepa Kuokoa, Buke LXII, Helu 44, Aoao 5. Novemaba 1, 1923. This entry was posted in Election, Mele, Political Commentary, Political Party and tagged Nanea Armstrong Wassel, Wiliama Heen, William H. Heen, William Haehae Heen, William Heen by nupepa. Bookmark the permalink.